I recently linked up Merrily and Tony from the Central Coast Scooter Club to install two Nautilus Air Horns into our GTS250's. We'd heard that there was debate about whether there was room for a Nautilus in the GTS and if so, was it where the old horn sat or behind the left knee pad? 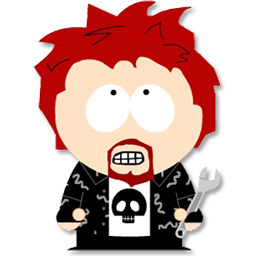 Merrily bought the airhorns online and did a lot of forum research, and Tony provided the engineering workshop. In the morning they had worked out that they would have to pull the glove box cover off to get into the frame where Tony designed and built a bracket to secure the air horn to the scooter. He'd previously wired up yachts and had the tools required. Merrily and Tony had sorted out all the glitches and R&D and they were ready to go. 1) Remove the plastic Piaggio badge carefully and unscrew and remove the horn cover. 3) Disconnect the lead to the parking light. Tape these leads to the side so they dont get lost behind the horn. T&M discovered that Mr Vespa had left convienant bolts and brackets just right for the horn and relay unit to bolt into. The next job was to unscrew and pull back the glovebox cover. There is a excellent thread that shows this operation screw by screw. Behind the cover there are two bolts welded to the frame. Tony make a bracket for the airhorn that connected to this bolt. He made it with a zinc covered steel bracket he had bought in the hinge section of the hardware supermarket for a dollar or two. He bent the bracket to shape and rebored the holes to fit the new bolts.When the bracket was bolted on the horn sat very securely. It was a very stable stebel. Next thing was the wiring. This is the wiring set up we used. 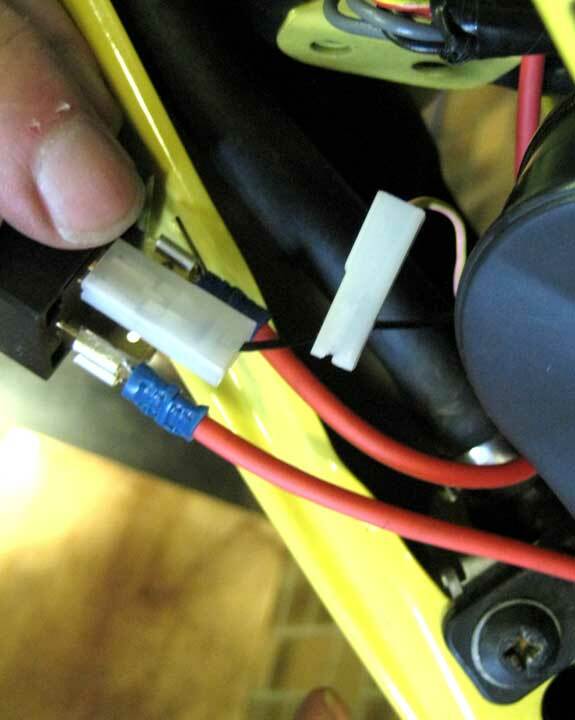 We decided to run a 20amp negative wire from the battery to the horn rather than an earth to the scooters body. 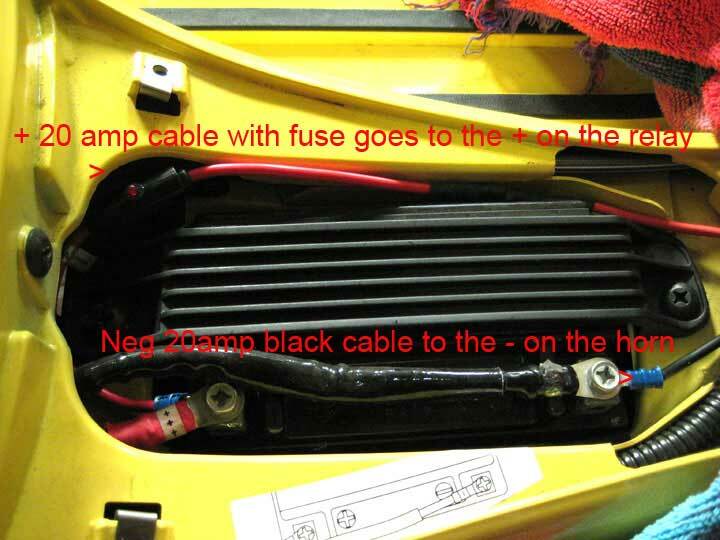 Tony had also sourced a 20 fuse holder that glowed a red light if the fuse was blown. We also ran a red 20amp positive cable from the relay to the horn. The second pic is the relay being wired up. We found that the negative cable from the original horn lead of our GTS's were black, the positive yellow with light red stripe. This is the battery set up. We ran the cables up through the floor and up to the horn alongside the other wiring looms. We connected the cables, bolted the horn and relay in and replaced the glovebox cover. There is a trick with the glovebox opening lever getting in the way and there are some threads that use rubberbands or tape to hold it back when fitting the cover. We slipped in a long screwdriver and held it back with that. Also we dropped a couple of metal screw holders which took a bit to find again. Then I reconnected the parking light and re attached the horn cover panel. Everthing went smoothly and we did it in a couple of hours, now have two GTS's that sound like freight trains. Big thanks to Tony and Merrily. Excellent write-up, and thumbs-up too. Pete, I cannot, for the life of me, figure out how you got this to work. My glovebox/fusebox ends up needing the space where you have the horn mounted. Any thoughts? Thanks for the pics. I used them to install mine. Enjoy the ride! Disregard, it fit. Thanks for the post, very helpful. Good stuff Pete. I can't wait to hear it! Does it always waste electric power for filling up air in the completer? or just wast it when push the horn switch? 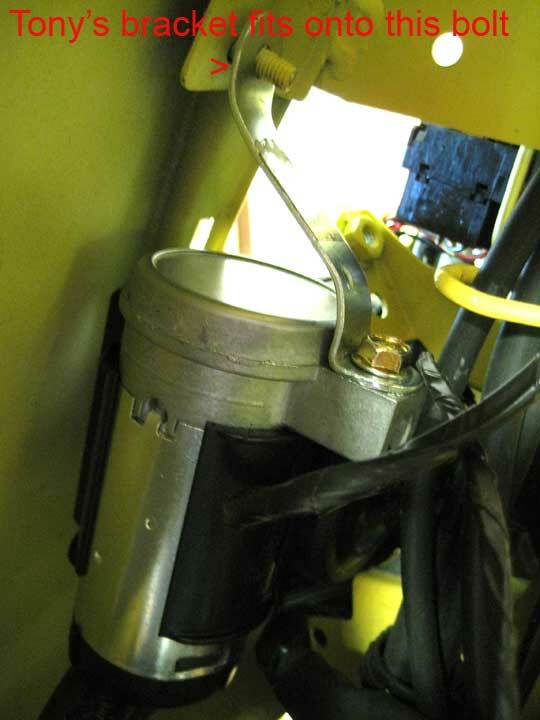 The compressor only runs (uses electrical power) when the horn switch is pressed. No 'background' drain. that words were very easy to understand for me. I've just installed the same horn on my GTS and instead of using the bent bracket as petegailey did, I simply jammed the horn into the available space and fixed it in place with a couple of zip ties. It seems to hold fine and doesn't bounce or rattle at all. Is the whole installation possible WITHOUT having to remove the Glovebox??? Meaning, access everything from the front horn cover??? Ive been aching to go with this project coz the puny stock horns are irritating as f*ck!!! I have a Kymco Like 125 & I have a classic Stebel Horns with the seperate compressor & 2 horns installed on each side inside the front cowl & theyre great!!! IMO The Stebel is a must have in city traffic and has saved my bacon heaps of times. Took the plunge today & i did manage to pull clear the Glovebox & the installation went smooth considering it took me pretty much my whole Sunday coz I was super careful running all the wiring, the mounting of the horn & looking back on this thread at least 10X just within the day to make sure I have everything covered. I even went as far as zip tying every where the wiring was running to make sure it wont coz any future grounding coz, i would hate to remove everything back. I also double secured the horn by both zip tying it on the bracket behind & also using the bracket same as the pic above attaching to the nut above. With everything in place, i would like to say Thankx for this thread. I wouldnt be able to do this DIY project it wasnt for this. Thank you for posting such a clear and useful set of instructions! While I did not completely remove my glovebox or use a metal bracket for my Stebel (used strong plastic ties instead), I 'did' follow the electrical wiring suggestions exactly, and am glad to say that the upgrade went smoothly and without incident. Looking forward to 'being heard' should the opportunity ever present itself. Thanks for these detailed step by step instruction. 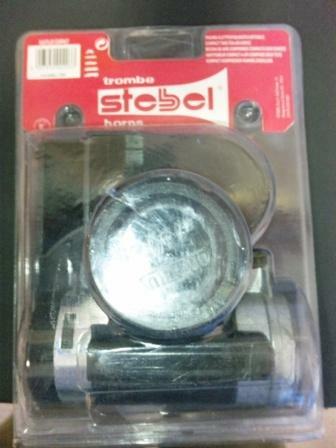 Just received my Stebel horn and will ask my shop mechanics to install it together with the Audicator. Can't wait to hear the horn ! Given the amount of current the Stebel compressor draws when the horn button is pressed, the lights will dim. Small price to pay for the horn that makes cagers drop their phones. 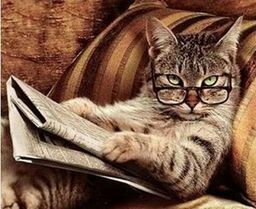 You have me worried there, should I be worried for my battery ? Unless you plan to hold the horn button down constantly your battery will be fine. The compressor on the stebel would die before the battery from constant use. Thanks Perry, I already had a horn light installed on my GT200 which is drawing power from the battery and also will have the Audicator installed which will increase the load. Thanks, I used this guide to install the Nautilus horn on my GTS. I used a bracket made from a scrap of steel to mount the horn similar to that above. The bolt that is welded to the frame is an M6, so an M6 nut is what you will need to secure it. Also, I failed to note the polarity on the horn. 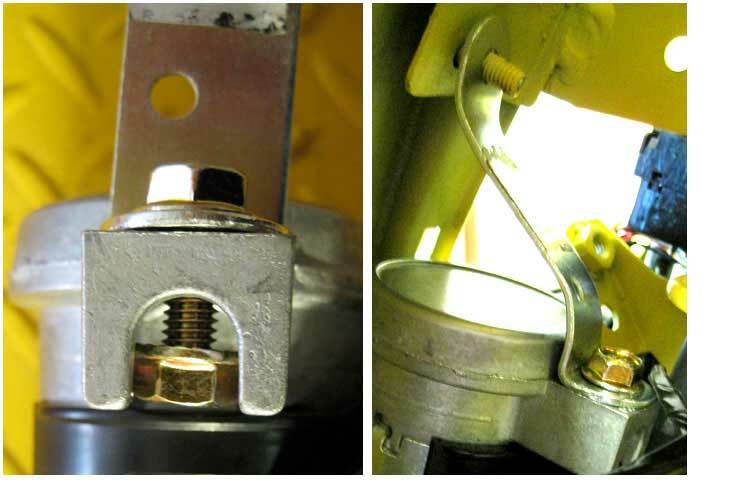 If you wire it backwards it will just quack like a duck If this happens, swap the wires on the terminals to the horn and all should be OK.
Also, found from another topic on glovebox removal - if your glovebox is getting a little tricky to open, the screw holding the hinge is probably loose. Tighten while you have the glovebox off and add a dab of pva glue to the screw (not locktite or super glue - it is supposed to melt plastic) and this will be fixed at the same time. Yes just parallel the wires to the positive and negative terminals of the new horns. 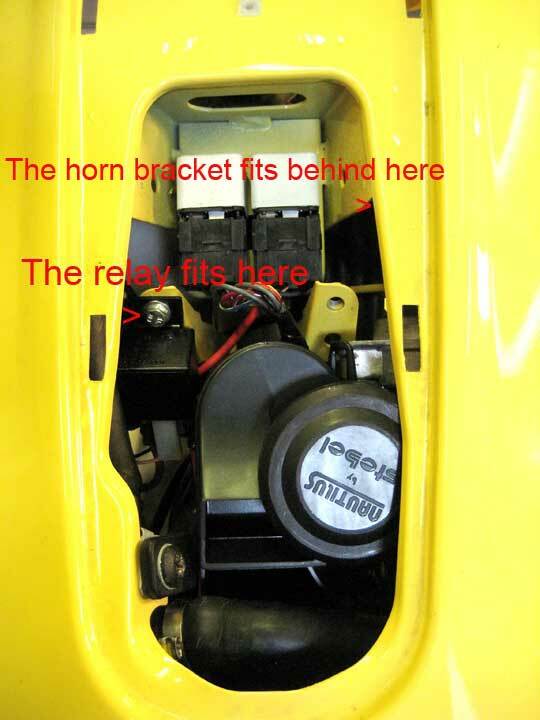 Leave the relay in place to lessen the current going through the horn button. Thank you so much for this thread, I followed your wiring instructions which were great. I installed the horn into a GTS 300, which has a horncast light that made the fit of the stebel even tougher, but I managed to get it in there and secured with some zip ties. It is really in there with the zip ties so I am glad that worked out because I couldn't fashion a bracket for it. It is SO LOUD! I actually had to use it within 20 minutes of my first ride with it installed and it actually made me jump! EDIT: relevant only if you need to split or separate the Nautilus into its two pieces...perhaps not necessary with the GTS for which this original post was written but certainly is for smaller scooters. A post from the future...Stebel at some point started epoxying the two parts of the Nautilus together. These are for all intents and purposes inseparable, as I discovered last night after an hour and a half of chipping away at the plastic with a lot of pointy tools, and doing more damage to my hands than to the bond betwixt pump and horn. The coup de grace is the glueing of the pump output tube into the horn input; you just can’t get those apart without destroying the horn. 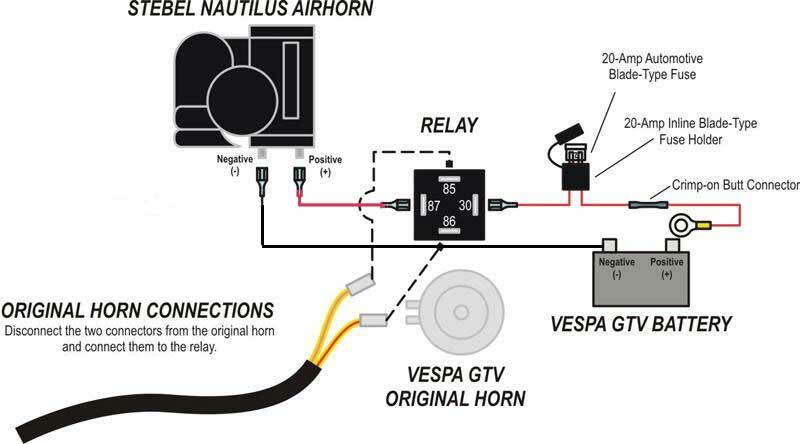 It turns out that the Stebel USA website sells “scrape and dent” versions of the Nautilus that are already separated and connected by a tube...for apparently less than the cost of the horn on Amazon. So that’s what I ordered this morning, and we’ll see what happens. “Scraped and dented” is mild compared to what I did to my hapless brand new one. If you search for the Chinese version of this pump model YSK-888, it is the exact horn and as of this week I can confirm they are not using ANY glue on the housing to hold the pump in. I destroyed a streobel trying to separate to install on my Harley and took a gamble that the Chinese version would not spend the extra money on glue. I was right!